The legendary 'Lost City of Machu Picchu' is without a doubt the most important tourist attraction in Peru and one of the world's most impressive archaeological sites. Built by the Incas on the summit of "Machu Picchu" (Old Peak), overlooking the deep canyon of the Urubamba river in a semi-tropical area 120 Km. (75 miles) from the city of Cusco at 7,000 feet above sea level. It sits on a mountain site of extraordinary beauty, in the middle of a tropical mountain forest, Machu Picchu was probably the most amazing urban creation of the Inca Empire at its height, with its giant walls, terraces and ramps, which appear as though they have been cut naturally in the continuous rock escarpments. The natural setting on the eastern slope of the Andes encompasses the upper Amazon basin with its rich diversity of species. The whole archaeological complex covers approximately 5 square kms. It is situated in the high jungle. Its climate is semi-tropical, warm and humid. On foot - following the traditional and true route of entry, best known as the Inka Trail. 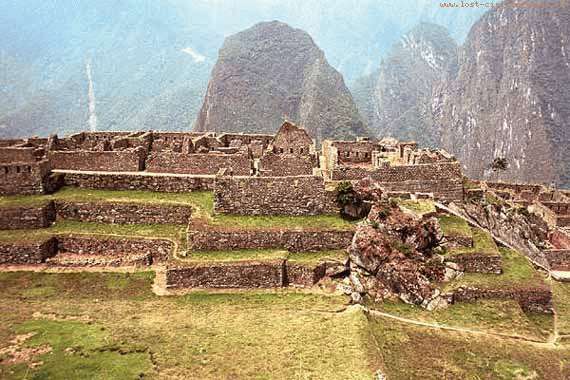 Machu Picchu is also one of the Inca's best kept secrets, since they did not left written records and Spanish chronicles make no mention of the citadel, it remains a mystery. Discovered only in 1911 by the American Yale professor Hiram Bingham. 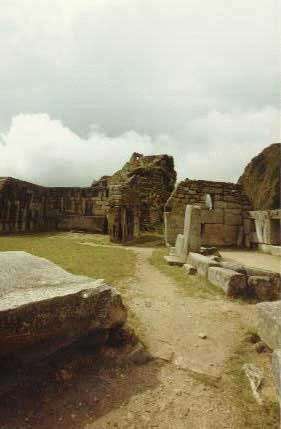 The building style is "late imperial Inca" thought to have been a sanctuary or temple inhabited by high priests and the "Virgins of the Sun" (chosen women). Excavations revealed that of the 135 skeletons found,109 were women. No signs of post Conquest occupation were unearthed. 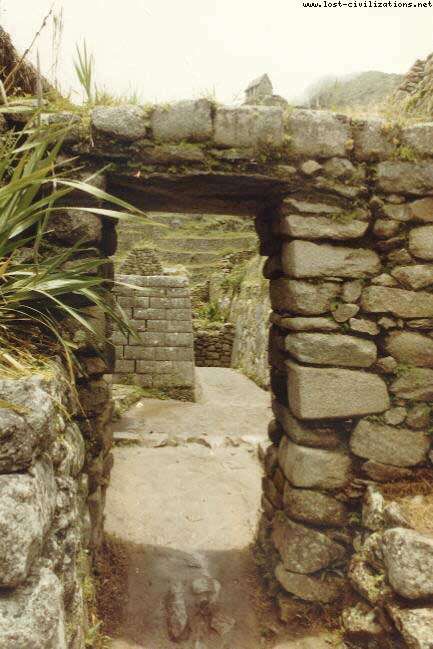 The original entrance to the complex is on the southwestern side of the citadel at the end of the Inca Trail, a short walk away from "Intipunko " (Sun Gate), the ancient final check point to Machu Picchu. The present entrance on the southeastern side leads to the agricultural section. The complex can be divided in three distinct sections: Agricultural, Urban, and Religious. The agricultural area consists of a series of terraces and irrigation channels that serve dual purpose, as cultivation platforms making it self sustained, and as retention walls to avoid erosion. Some smaller buildings next to large terraces are part of this section and thought to have served as lookout posts. 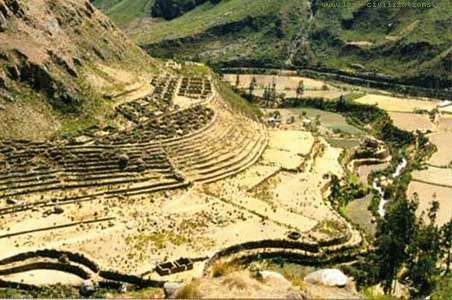 The urban section starts at the wall that separates it from the agricultural area, this group of buildings were constructed on the ridge that descends abruptly to the Urubamba valley. In the southern part of this section are found a series of niches carved on rock known as "the jail" with elements that include man size niches, stone rings would have served to hold the prisoner's arms, and underground dungeons. The group of refined structures next to "the jail" is known as the "intellectuals' quarters", with tall walls, nooks, and windows built with reddish stone are considered to have been accommodations for the Amautas (high ranked teachers). One of the buildings has several circular holes carved on the rock floor named the "mortar room" believed to have been used for preparation of dyes. 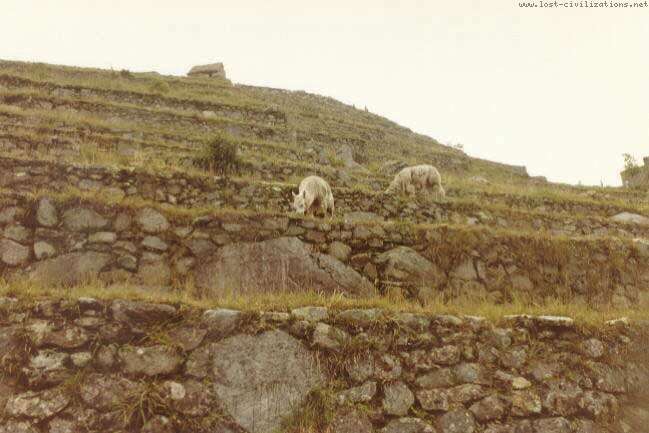 The largest urban section in Machu Picchu located on the north western part, is reached by a 67 steps staircase and involves a group of buildings not as finely constructed as other parts of the complex. The central plaza that separates the religious from the urban section, has a great rock in the center. The religious section contains splendid architecture an masonry work, one of the most important and enigmatic is probably the Intihuatana shrine, this block of granite was presumably used to make astronomical observations. Descending the hill next to this site is the Great Central Temple, a three walled building with fine stonework and an attached smaller temple called the "Sacristy". Next to this structure is another three walled building, known as the 'Temple of the Three Windows', so called because of the trapezoidal openings on the east wall. 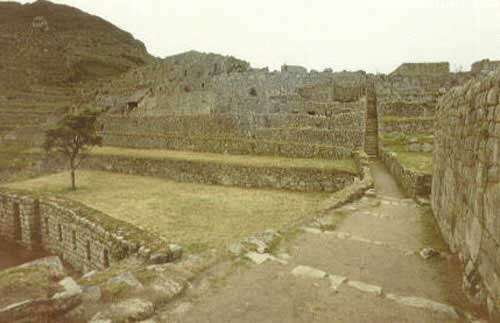 Directly across is the Royal sector, with ample buildings typical of Inca royalty. 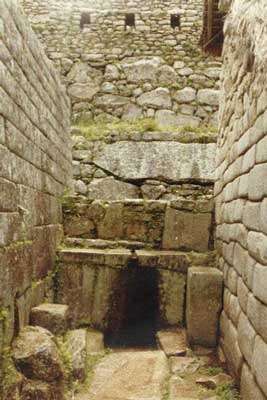 A very important structure in this section is the "Temple of the Sun", a: circular tower with the best stonework of Machu Picchu. Its base forms a cavern known as the Royal Tomb. Recent studies show that the actual purpose was for astronomical observance. Huayna Picchu, young peak, is as much a part of the site as the buildings of the citadel, the towering granite peak overlooks Machu Picchu to the North with a steep well preserved original Inca path, well worth the one hour climb for an astounding view of the citadel and the entire valley. 'The Temple of the Moon', located halfway down in an underground chamber on the north side of the Huayna Picchu, is a fairly recent discovery. The access to this site is rather difficult and diverges left from the main trail. It contains finely carved structures on large boulders. The climb to the top takes about three hours. Only from the nearby hilltop observatory of Intipunku can you realize the full extent of Machu Picchu's colossal conception. The citadel is a stupendous achievement- in urban planning, civil engineering, architecture and stonemasonry. Who built this symphony in stone, this vast complex of buildings so well constructed that even five centuries in the inexorable grip of the Peruvian jungle has deprived them only of their thatch and reed roofs? The architectural forms are unmistakably characteristic of the Incas but beyond that its origins are veiled in a mystery as thick as the early morning mist swirling around its craggy fastness. Thanks, whoever wrote this. It helped me a lot! Really informative. pleease, who wrote this page?? Lastly, some info on the religion would be nice. . This needs a little more info... I need some info on the Temple of the Sun. Who is the author to this page? This website was a great help on my Inca Civilization project. Keep up the good work! Wow this was really interesting. I really enjoyed scanning through the info. Awesome pictures! I am the translator of Dr. Angles book "Machu Picchu and the Inca Road". I noticed some excerpts were taken verbatim from my translation and NO credit was given to either the Author, Dr. Angles or to the Translator, Franco Gamero. This is extremely important because Dr. Angles' version is extremely unique and accurate. The translation is equally important because it is also accurate and captures the essence of Dr. Angles' conclusions. Please contact me as the contents of this book is under contract. Thank you. Yup, this helped me out! I have noticed that Machu Picchu is on the Sonic Adventure poster and on the front cover of the game. It is also in the game when you play it and alot red echidna's are walking around the altar. I'm doing a reoport on the inca and this helped me out a whole lot!